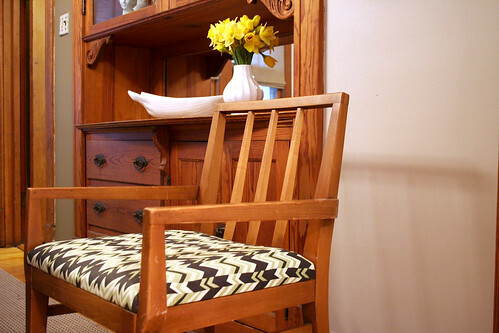 I upholstered one chair as a test in Amy Butler’s Ritzy Stripe fabric. It looks great, but I’m not sure what to do for the rest of the room. Creamy white walls and a green ceiling? A green rug? 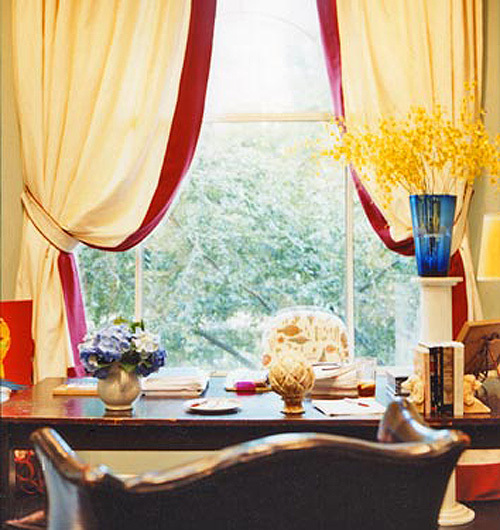 Photos of Drew Barrymore’s Flower Films offices (in the April ’08 issue of Domino) have been making the rounds on the design blogs recently, and I love the curtains in Nancy Juvonen’s office. Perhaps I could do something similar, but with green or black trim. 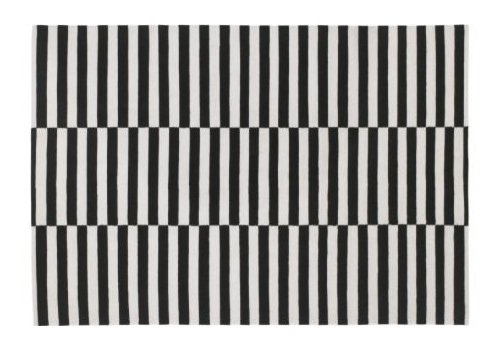 I’m also still obsessed with the black and white rug I saw during my recent IKEA visit. Is it too much with the chair pattern? I know, it probably is. Maybe I’d use the rug and then go with a solid chair fabric. Yes? The colors go better together than they appear to in the photos above. I think the different scales of the patterns might work together (maybe?). Why is this the one room where I can’t make a decision? Meh. Previous Post Little Easter Chicks? I love that fabric. Rather than go all out on the bones (rug/walls)maybe you need to change the accessories to get a feel for it? A contrasting throw pillow on the chair with more of the green on it? Swap the daffodils for green hydrangeas, or similar? Perhaps a brown and cream vase on the dresser. And I think Murray’s new collar Hankie would look great as edging on curtains. I’m not seeing the black & white rug with the seat cushion though…. Just saw this green Flor rug at apartment therapy. Then on the walls you can use use a warm gray–I don’t like the brown up there right now. It’s warm and lovely, but I feel like it competes with the woodwork. You can do curtains in either your favorite from the guest bedroom http://store.txtlart.com/luna.html or a warm white/cream with raspberry or orange edging. The raspberry would bring in a variation of the pink from the rest of your house. You can also put edging on the lumimarja fabric, too. I wanted to mention that I went to Linen N Things (the one on canal in the south loop) the other day and they had this fabric shower curtain called Dots & Spots with light brown and pale pink dots all over it. They don’t have that color combo online, otherwise i would have linked you. They dots are large, maybe 2.5 inches round, I thought it was really cute and instantly thought of you. Hey that is ritzy! It looks great. hmmmm maybe you need to take another little visit to ikea and take the fabric with you to help you finalise your decision ??? eh…I kinda think that upholstery makes the chair look like it belongs next to a fireplace made of fake stone at camp whataghanga. I love the rug and fabric combo! I would do a cream on the walls and keep the other accessories minimal to let those elements shine. I think doing a green rug would be just too predictable. I love Jules’ suggestion of bringing in a little orange or pink. I think the color pallete needs one other color to complete it. Best of luck! I love the fabric as well, I think you need a pop of another color in the room somewhere. The trim on the curtains is a good idea (I’d seen that as well, that office is pretty nice isnt it?). What about adding in a cranberry/rose/subtle pink?